Fall Out Boy have cemented their position as one of rock music’s biggest-selling bands. Their seventh studio album M A N I Adebuted at #1 on the Billboard 200 chart and claimed the #1 spot on iTunes in more than 30 countries upon its January 19, 2018 release on Island Records/DCD2 Records. The album marks the band’s third consecutive and fourth overall #1 album respectively, and features the hit tracks “The Last of the Real Ones,” “Champion” and “HOLD ME TIGHT OR DON’T.” M A N I Ais the follow up to the band’s Platinum, sixth studio album AMERICAN BEAUTY/AMERICAN PSYCHO, whichdebuted at #1 on the Billboard 200 and peaked at #1 on iTunes in more than 22 countries upon its January 2015 release. The album’s first two singles “Centuries” and “Uma Thurman” have been RIAA-certified 4x and 2x platinum, respectively. AMERICAN BEAUTY/AMERICAN PSYCHOfollowed the GRAMMY-nominated band’s gold-certified album SAVE ROCK AND ROLL, which debuted at #1 on the Billboard 200 and #1 on iTunes in 27 countries upon its April 2012 release and features the multiplatinum hit “My Songs Know What You Did In The Dark (Light Em Up)” and hit “Alone Together.” SAVE ROCK AND ROLL was the band’s second #1 debut; Platinum selling “Infinity On High” topped the chart in 2007 which followed multi-platinum breakthrough album “From Under The Cork Tree” released in 2005. They were most recently nominated for a 2017 MTV Video Music Award for BEST ROCK VIDEO (“Young And Menace”) and have won FAVORITE ARTIST: ALTERNATIVE ROCK at the 2015 American Music Awards, BEST ROCK VIDEO at the 2015 MTV Video Music Awards and BEST ALTERNATIVE BAND at the 2014 People’s Choice Awards. Fall Out Boy has also written the song “Immortals,” featured in the Oscar®-nominated Disney hit movie Big Hero 6, which topped the box office upon its November 2014 release and has already surpassed $222 million at the domestic U.S. box office and topped $650 million globally. 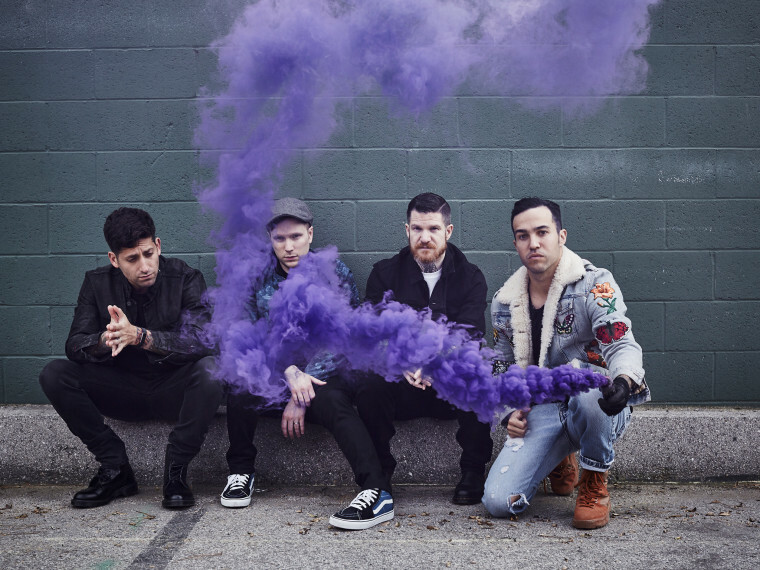 Hailing from Chicago, Fall Out Boy—Patrick Stump (vocals/guitar), Pete Wentz (bass), Joe Trohman (guitar) and Andy Hurley (drums)—has appeared on the cover of Rolling Stone and other prestigious publications. They have performed on Saturday Night Live, The Tonight Show Starring Jimmy Fallon, The Today Show, America’s Got Talent, The Voice, Late Night with Jimmy Fallon, The Tonight Show with Jay Leno, Conan, The Late Show with David Letterman, Jimmy Kimmel Live!, Good Morning America and many more. More information can be found at www.falloutboy.com.